Shading our models is something most of us take for granted. A quick wash with Badab Black or the almighty Devlan Mud and 99 percent of us are done. And rightfully so. It doesn't take much most of the time. The trick though is getting your shadows to be consistent across the light and dark areas on your model. Most of the time this never even comes up since we have single color models. By that, I mean an Ultramarine is blue and not much else. It becomes an issue when you get into different colored quartered and halved color schemes. Make one of those colors light and the other one dark and the potential for contrast problems increases. Aurelius Legion was gracious enough to allow me to use one of his models as an example of this very thing. He recently posted his work on weathering and battle damage after trying out some of the techniques he found here on FTW. I love the look of his weathering, but something did not seem right when I was looking through the pics of this guy. And then it hit me, the shadows that should be in the yellow or light area on the model were not there and the yellow areas overall seemed to flatten out in comparison to the darker portions of the model. I took his photo and added some shading where I thought it might help the yellow areas come together and look similar in terms of lighting when compared to the darker areas on the model. It's not much more than pushing the contrast in the shaded areas within the yellow area itself. By pushing the contrast in the yellow areas and making the shadow areas look like they are in "shadow," you can really define the pieces of armour and bring the model to life. If you go back up to my picture at the very top, I tried to do that with my model in the light blue areas. In places where it's not a very deep recess, it only goes to GW Shadow Grey. In the places where the recess is deeper or the area is in shade, it goes to almost black (around his ankle). Same thing around his collar above his chest eagle. And I haven't always done this right myself. Sure, you can chalk up lots of things to just painting to a "tabletop" standard, but the idea is to find those small things you can do to your models that don't take a tremendous amount of time but yield great results. Take this guy for example. He looks good, but if I'd pushed the contrast in some of the deeper recesses on his white armour, he might have come out a little better in the end. Not much, just a bit more here and there to really define some of the different armour plates would have been all he needed. Sometimes it's not as easy as just throwing a wash on there. Sometimes you need to help the illusion and push the contrast in key spots in order for it to look like it has life to it. Is just putting down a quick wash wrong? Absolutely not, but taking a few more seconds and adding that additional shadow may take your model up to the next level. Interesting article! 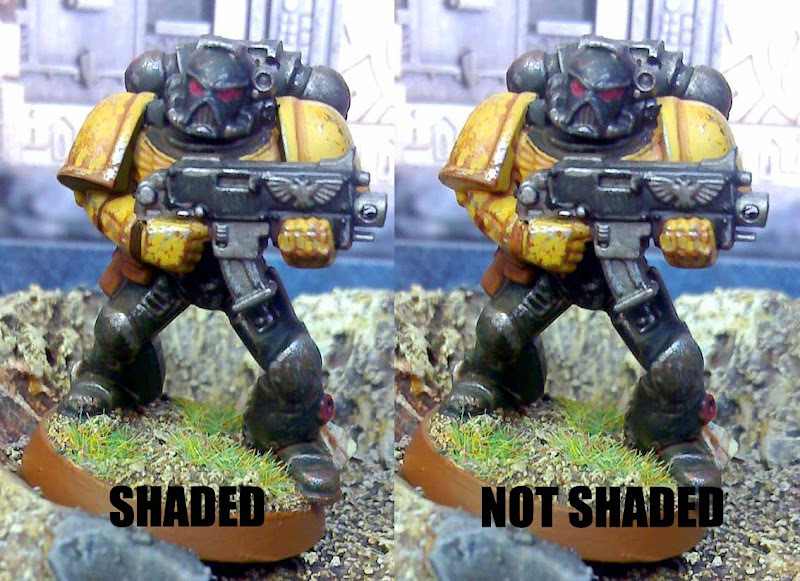 Question, when you shaded the model, what did you use to tone down the yellow? A wash or a mix of yellow and the black? I'm curious as I'd like to play around with shadowing now. Thanks! I really like that effect! Might try it on some of my models. So, for the shadows, did you water down the paints, or was it just a layer of whatever shade of gray/black you needed? A lot of this is color theory 101, but I know a lot of people in the hobby aren't exposed to that. I really love how you break this stuff down and make it so easy to follow. Great post and something I need to pay more attention to when doing my own models. Roland: I shaded the model on the computer to represent how I would do it. 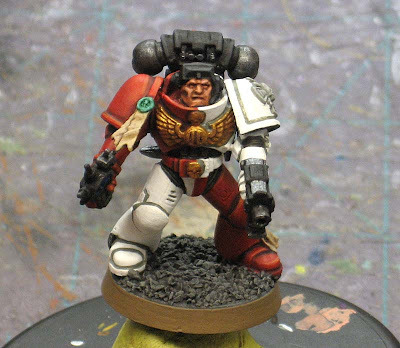 I don't have the actual model, I borrowed the picture from Aurelius Legion. 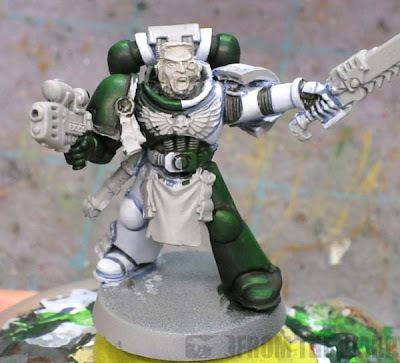 If I were to try and do this very thing on a model, I would first give the area a wash of Devlan Mud. Then maybe a wash of Badab black in the deepest recesses only. I suspect the Badab Black would not get it as dark as I want though so I'd most likely thin some black paint and add it into the deep recessed areas to really push the contrast. Reuben: Sometimes I'll water down a darker color (dark green for green areas, dark blue for blue areas, etc) for the shadows. That's what I did on my blue/green model up top. The light blue areas were washes with GE Shadow Grey and then cleaned up with the original color. I try and keep black limited to the deepest recesses only on a model. The Harrower: You're absolutely right. Some folks read this stuff and it's nothing new, others look at it and it's all foreign. My hope is that if I break it down into manageable and easy to understand pieces, it won't matter who passes over it, there might be something in there to help. Painting up from black, like how we did some of the B2B, is a great way to keep the contrast from the very beginning. Where I just added layer upon layer of colour, leaving out the recesses. Ron, thanks for the article, I will go back and try to execute this on the model and see how it turns out. Will keep you posted. Another good strategy for shading yellow from mid tone to darkest is Sepia-->Devlan-->Badab. I'm trying that out now on a Bad Moon inspired color scheme, from a Tausept Ochre basecoat. I like to use browns (esp OOP Chestnut Brown mixed with yellow) as much as possible as black can tend to turn yellow to green, esp. the lighter tints of yellow leaning on the cool side (such as OOP Bad Moon).